The caffienated nature of NY Comic Con: Loud, nerd cheering, boisterous as a stadium huzzahs. Hot, sweaty cosplay. Skinny guy in a Sonic costume, posing on a motorcycle long as an SUV. Completely energetic dancing girls in the booths, so peppy, they could fly like a 60s comic book hero. None of these visions had one whiff of the darkness present in today’s graphic novels. There was just excitement and glee in the familiar fiction they chose to honor. There was one thing that was completely unusual, something that appeared to be out of place when I first saw it: the Craftsman tools booth. The only reason I stopped by – and I stopped by with trepidation – was because I own a Craftman nail gun, and that nail gun was invaluable in helping me rebuild a balcony at my secret lair in the mountains, my version of the Fortress of Solitude. So why show tools at the Comic Con? 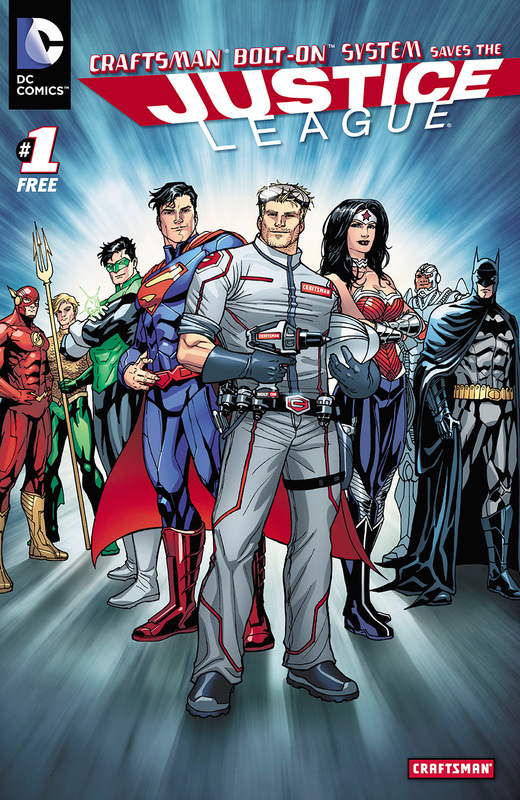 Craftsman hired the minds at DC to create a giveaway comic featuring a hero called The Technician that uses one of the company’s new tools as his superpower. He partners with the Justice League as a fixer of the Batmobile and the Invisible Jet. Not a bad book at all. Get it here. Inside the booth, builder and TV host Mike Senese was toiling away at creating a wooden version Superhero HQ using Craftsman tools. He was all gunned up to go, tool in hand. By the end of the con, it was ready to go. So why is this piece on the Circle’s site? If Craftsman can do a fairly elegant presentation at NYCC, they can do it with games, too. In fact, I hear that may be their next plan. The Technician, done right, could make a great iOS game. Designed with heart and tech savvy knowledge, it could become a compelling puzzle game or a platformer. Yes, you could say Sears, Craftsman’s parent, is a big, slick company, one that’s horning in on nerd culture. But if you want games to be a mainstream form of popular art that, as we in the New York Videogame Critics Circle hope it to be, you’ll welcome the smarts and muscle of a company like Craftsman – as long as they can work respectfully with a company like DC or with the great indie game developers who could create a dynamic game starring a nuanced character like The Technician. ← Our Very First Halloween Hoohah!